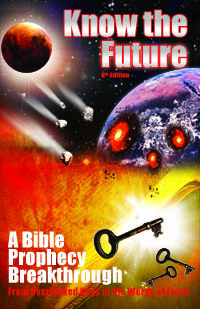 Bill Salus has written a book sharing his concept of end time Bible prophecy. One aspect that distinguishes his work is that it brings attention to Psalm 83 which is an overlooked unfulfilled prophecy about a coming Middle East nuclear war covered on this site and in my own book, Know the Future. Unfortunately, it is clear he has made the same mistake that so many prophecy teachers do today. He has proceeded to make conclusions on specific prophecies without first understanding and laying out the full chronological roadmap of Revelation and Daniel. As so many others before him have proven, if you do not study and understand Revelation and Daniel fully, it is very difficult to come to the right conclusions on where the prophecies fit in relation to the rest or what exactly they entail. One amusing idea in his book is that the dry bones prophecy of Ezekiel 37:1-9 is a reference to the I.D.F. army of Israel! The right answer on this is that it means exactly what it says: it speaks of the future resurrection to flesh of all those of the house of Israel (and by extension all nations) who died without hope/salvation. This is the second resurrection that Revelation 20 speaks of as when the "rest of the dead" live again. The purpose of this is for the majority who lived and died to finally know and live the truth without Satan's deception. In other words, people who die without being saved (99% of the population) are not condemned but get their chance in an easier postmillennial world free of Satan and the demons who deceive all the world today (Rev 12:9). The rest of his eschatology is full of the popular theories familiar to those who have searched to find solid answers on prophecy with little success and much discouragement. He has the Ezekiel 38/39 Gog Magog war defined as Russia coming against modern Israel in a pretrib timeframe. (In my book I show that these are actually two wars that serve as bookends to the Millennium). His theory for how the Antichrist comes to power in Israel is that he comes to neutralize a "super nation" Israel after her Psalm 83 victory. This sequence is wrong because it completely leaves out Wormwood. The timeline of Revelation telling us that the Antichrist rises to power at the 5th Trumpet immediately following the devastation of Wormwood from the 6th seal through 4th Trumpet. The ensuing global crisis of cold, famine, war and chaos is the problem that only the Antichrist can solve which forces everyone to give their worship to him so they can eat and prosper again. Obviously I do not recommend the book. I wish I had more good to say about it, but this is nothing against Bill and if anything he has done better than most pretrib eschatologists. In fact, I am glad that Bill has opted to study and teach prophecy when most Christians consider the study of prophecy in a negative light. I also congratulate him for teaching correctly that Psalm 83 is unfulfilled and must come to pass before the tribulation. I hope he continues to search out prophecy especially with a focus on understanding Revelation literally so he can better audit his theories. The study of prophecy requires an iterative approach, and none of us, including myself, get it right in our first stab at it.